CURAVIVO is a stimulating patient environment that stimulates the senses – and which targets patients at hospitals, nursing homes and psychiatry. CURAVIVO is Latin and means “living care”. CURAVIVO has been developed in cooperation with the staff at the neurosurgical intensive care unit NIA1 at Aarhus University Hospital. CURAVIVO includes Chroma Zenit Circadian Lighting and functional lighting, noise masking and music intervention, individual info monitors and visual observation. 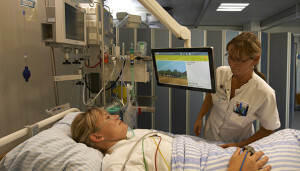 Subsequently, a CURAVIVO stimuli room concept has been developed, targeting demented residents in elderly care. Chromaviso is a part of CURAVIVO as the supplier of Chroma Zenit Circadian Lighting and functional lighting.